Sony Vegas Pro makes it easy to import and edit movies, images and music for creating your next video or audio masterpiece. However, it will be a frustrating thing if you have problems of importing video files to Sony Vegas, especially the video files are the so common MP4 files. 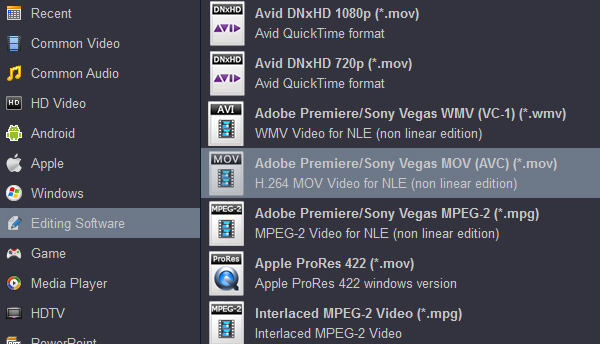 Though MP4 is a listed supported format by Sony Vegas, many people are having problems of importing MP4 to Sony Vegas. The latest Sony Vegas 13 still won’t solve “Sony Vegas Won’t import/read/open/accept some MP4 files”. If your computer is powerful enough and you have enough space on your hard drive, but still have problem of importing MP4 to Sony Vegas, the issues can be caused by the unsupported audio and video codecs packed in the MP4 container. you can follow the following methods to have your problem solved. By converting the unsupported MP4 to Sony Vegas Pro supported video format (WMV, AVI, MP4, MPEG-2 or DV), you can easily import MP4 to Sony Vegas for editing. Free download the powerful MP4 to Sony Vegas Converter – Acrok HD video Converter and run it. Click “Add Video” button to add MP4 filees to Acrok MP4 to Sony Vegas Converter. Or you can also drag and drop your MP4 files directly to the main interface of this powerful MP4 to Sony Vegas Converter. Click on the drop-down button on the right side of the “Format” to set Sony Vegas compatible video “MPEG4 Video(*.mp4)” or “WMV – Windows Media Video (*.wmv)” or AVI or DV as output video format from “Common Video” Category. Click “Convert” button to start and finish converting MP4 to Sony Vegas supported video MP4, WMV, AVI, DV, MPEG-2. When the conversion is finished, simply click “Open” to get the converted MP4 videos, and then drag them to the timeline of Sony Vegas Pro. It’s that easy to solve “Sony Vegas Pro can’t import, read, open, recognize or accept MP4″ issue.